All FSU Faculty, Staff, Students, Retirees, and Alumni are eligible to receive email accounts. For most users the email sign-in and password credentials will be the same as their FSUID. Email addresses are created after activating an FSUID. Students are normally issued email addresses based on the first initial of their first, middle, last name, and the 2 digit year of admission. The format will be "FSUIDusername"@my.fsu.edu (Ex: John M Smith will be "JMS13@my.fsu.edu"). If this address is already in use an additional character may be added (i.e. number or letter). "FSUIDusername"@my.fsu.edu and password will be your sign-in credentials. This will be the same password used to access your Canvas. Sign in to your student Office 365 Email Account. Email addresses are created during the hiring process. Faculty, staff, and retirees are usually issued email addresses based on their first initial and last name. The format will be "FSUIDusername"@fsu.edu (Ex: John M Smith would be "JSmith@fsu.edu"). 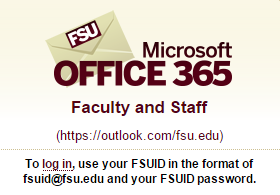 "FSUIDusername"@fsu.edu and password will be your login credentials. Sign in to your Office 365 Email Account. Look up your email address and contact information. You must first log onto myFSU and click "Hi, YourName" in the top right and select My Profile. Information that will assist you with password resets. Information that will assist you with email forwarding. 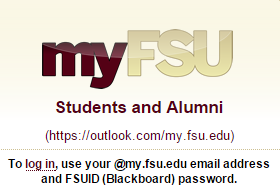 FSU strongly encourages you to use your @my.fsu.edu account to manage all official FSU communications. Look up your email addresses, aliases, and contact information associated with your FSUID. Information available on how to request a new Email alias for your FSUID. Updating your preferred email address at FSU will alter the primary email address campus services uses to contact you. Information that will assist you with email forwarding. Use the FSU Service Center to submit a Case with the required information. See the pages located in the "What are they?" section for the required information for each account type. Information that will assist you with accessing your Generic/Shared account via Outlook and OWA.